You have probably seen or heard the story of “the nurse who injected a child with blood”. Yes? Well the nurse’s name is Namubiru. I saw this story on NTV Akawungeezi – the Luganda version at seven in the evening. See the video clip below. My first reaction was irritation and deep inside I was wondering, how could a nurse who is over 50 (judging from her looks) be so heartless? At the same time I was reflecting on a post I wrote on the recent World AIDS Day – Are we “Getting to Zero”? 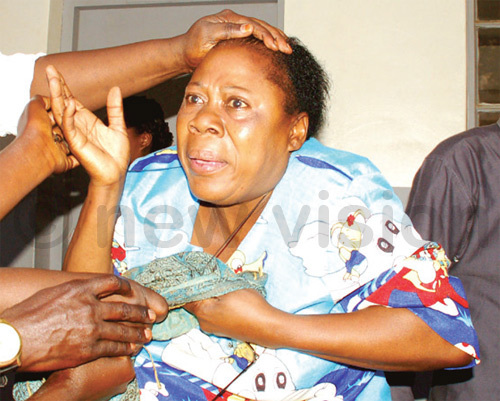 : The HIV/AIDS blame game in Uganda. This story really bothered me, the thought that a nurse could do such (to a child), made me sick in the stomach. Since then, I have followed the developments on this story. Once in a while I could catch a news byte to update myself on the case. As I continued to follow the story I learned that there were actually two different narratives and both of them were victimizing the nurse. One said that “the nurse used the same syringe she had used on her self to give a child a shot yet she was aware that she is HIV positive” while the other said that “the nurse had injected the child with HIV positive blood”. The other day I met some people who are following this nurse’s case. They mentioned that they were from court and that the nurse had been denied bail. They asked whether I knew anything about that case. I told them what I knew – basically the narrative that the media was spreading wildly; that the nurse injected a child with blood and infected her with HIV. Little did I know that this was far from the truth. This is how I learned the other story, one that is not known to many. According to the people who have interacted with the nurse and the parents of the child, the nurse did not actually inject the child with blood. What happened is that the child was on treatment and this nurse was supposed to administer a shot. Of course the nurse had a syringe in her hand. But we all know how much children fear pricking. So the child tried to resist and in the process the nurse pricked her (index) finger. The mistake the nurse did is going ahead to use the syringe that had pricked her on the child – why she didn’t do this, you and I will probably never know but she (the nurse) insists that she didn’t have any ill intentions against the child. The other thing I learned is, even though the nurse is HIV positive, apparently the child has been tested for HIV at least twice since the incident and she has tested negative on both occasions. If this is true, why does the Urban TV report – “Baby infected with HIV“? What does this kind of reporting mean for the child in question. 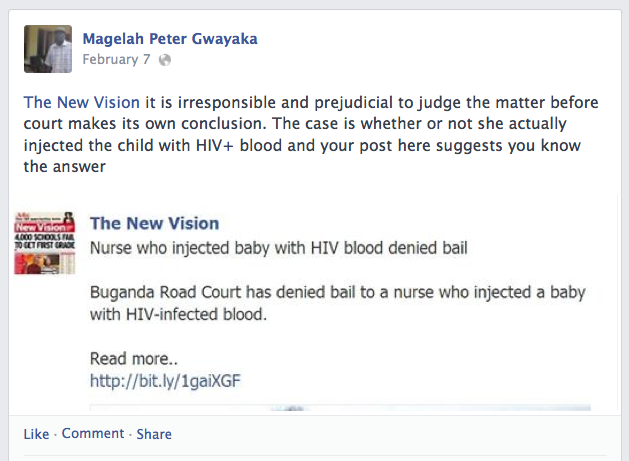 If the child is HIV negative, how will the narrative be reversed? Of course normally the media will rush into reporting without thinking about the damage this could cause to this child, her family or even the nurse who now seems to be a public enemy. The media has succeeded in telling us just what we want to hear. Human nature is characterized with complaining, victimizing and well, hypocrisy; the media uses those same characteristics to tell us a story that we can identify with, a story that will win our hearts. The New Vision picture below shows a picture of the nurse, Namubiru looking terrified. Once the media has set the ground with all their propaganda, the nurse story becomes of no relevance, even if she tells her story, how many people will be interested in listening to it? And this is where the danger of a single story comes in. In the end, media houses have nothing to lose. People enjoy reading these unbalance because they are easier to understand and easy for the journalists to compile in a short time. Here are some of the headlines from some of the most popular media houses in Uganda. Lack of professionalism or Ignorance? When I see stories like this in the media only one thing comes to my mind – that after many decades of reporting on HIV/AIDS, journalists and editors have learned nothing, nothing at all. Many journalists have failed to understand that they have a role to play in the fight against HIV/AIDS and that their role is not to spread the gospel of discrimination but to educate people through telling true and balanced stories. “Our health reporting is really lacking, we need training to help us understand those scientific terms and jargon language….” I have seen journalists front this excuse on several occasions. Well, I am NOT buying that no more! We are talking about the basics here, if you cant tell a simple story as it is, without fabricating the facts, am afraid even training on health reporting won’t benefit you much. When I look at how the media has portrayed this nurse’s story, I feel hopeless. I learned that this nurse has a daughter. With this kind of reporting, the nurse becomes a public enemy even before the public knows verdict. However, I still have faith that when the media and journalism is dies (if its not dead already), there are still people who are willing to tell and hear the balanced story, not to victimize or discriminate but to seek justice and make the world a better place. 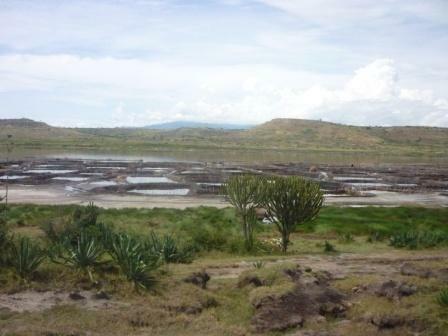 Lake Katwe – The Salt “Gardens” in Uganda! 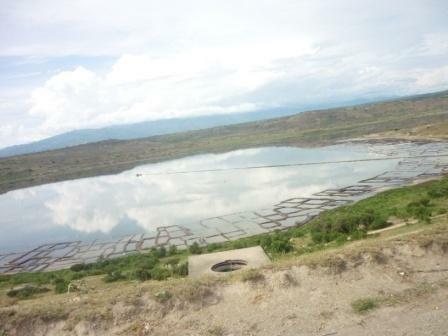 On a small lake – Lake Katwe located in Western Uganda, Kasese district-located in the East African rift valley region. The water in this lake is 60% salty. The region is semi-arid and the soil doesn’t favour agricultural activities. Therefore the major economic activity here is salt mining. Salt has been extracted from this lake since the 13th Century. It’s mined from small plot. When I saw the plots I got surprised. They are not the common plots of land like the ones you will find in central, Eastern or other parts of Western Uganda. These “plots” are ponds 10 by 12 feet or so wide and 3 to 5 feet deep. They are demarcated on the shores of the lake, owned by private individuals or families and inherited. 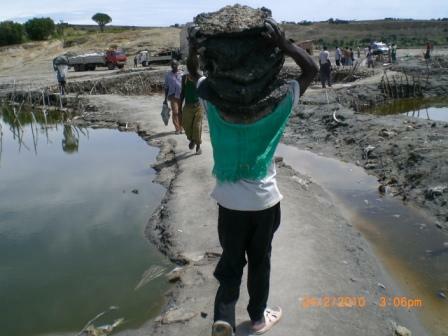 Mining in the center of the lake is only done by licensed individuals. The association for Rock Salt Extraction issues the licenses for extraction of rock salt from the middle of the lake. This type of arrangement was made to ensure that the salt is extracted in an orderly process without causing extinction. Two types of activities take place in this region and the roles are specified for the women and men. Salt winning (winning salt from the plots – done by the women). 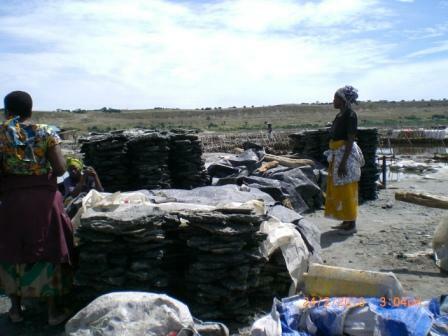 Rock salt extraction is done by the men – 3 days a week. The women scrap the bottom of the garden to scoop the salt. They use their feet to crash the salt to form small/fine crystals and then wash the crystals forming edible salt (washed salt/ sodium chloride). Some of the ladies who work in the salt mines. “In this village mention rain and people will curse you to death! We don’t like rain at all. Last night it rained that’s why people are all relaxed now and not working. Our major source of power is the sun. When it rains the gardens flood and the salt takes longer to form. The sun on the other hand makes the process of salt formation faster”, said Nicholas as he was taking us around the lake. The smell of hydrogen sulphide is all over the place (smells like rotten eggs). There are health complications in this job however. For the women when the female reproductive organs get in contact with this salty water more often, they develop uterus complications. On average one man extructs up to 1,000kgs of salt per day and he earns Ugx3,000 (USD1.50). On the side of the path are the plots (ponds) where the salt is mined. The men on the other hand are also affected. When the male organs get in contact with this salty water, they itch. This makes them scratch their male organs causing wounds. The men enter the water at 8am and work up to 5pm. They work for three days a week and each man extracts more than 1000kgs per day. “We are lucky that in this village we have never had any health complications caused by lack of iodine in the body say goiter”, said Nicholas as he was taking us around the lake. “For the men, we are using the wrong tool (condom)”. We call it the wrong tool because it’s meant for a totally different purpose. But under the circumstances we have nothing to do about it. The men fit the condom with a rubber-band on the upper end to make it firm” explains Nicholas. This prevents salt water from getting in contact with the male organs. Apparently a company called International Power Foundation is designing a more permanent solution for them in form of “protective suites”. plots - locally known as "ebibanja"
enough. The nearest governmental hospital (Kagando Hospital) is 14 kilometers away and in case of an emergency transport to the hospital is a big challenge. Kilembe hospital (another big hospital) is located 30 or so kilometers away. 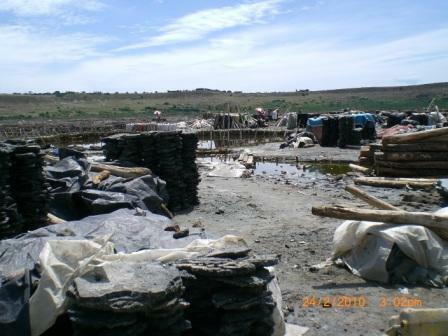 The environment is dirty, plus the luck of pit latrines, cholera outbreaks are also very common around the lake/ mines. The total population in this area is over 20,000 people of whom 10,000 benefit directly or work on the 4,000 plots around the lake in this salt mine.